Even if you didn’t go to business school, you’ve probably heard of Harvard case studies and the Harvard case method, the pedagogical system of choice at one of the world’s most elite business schools. In slim booklets, the cases, of which there are tens of thousands, lay out the strategic questions facing a major corporation, like Amazon, GE, or Pepsi. The scenarios they describe are real, all ripped from the business pages. The case method, as a style of learning, asks students to imagine themselves in the role of the “protagonist” (typically the CEO) leading the firm profiled in the case. They’re required to come to class prepared to make a solid argument for one course of direction, and then convince their peers of it, with rhetorical flair. Rather than lecture, the professor facilitates a class-wide debate, cold calling on students to answer tough questions. Before graduating, Harvard Business School (HBS) students complete 500 of these “decision-forcing” exercises, which are thought to be superior tools for training future corporate leaders, compared with discussing skills and theory in the abstract. 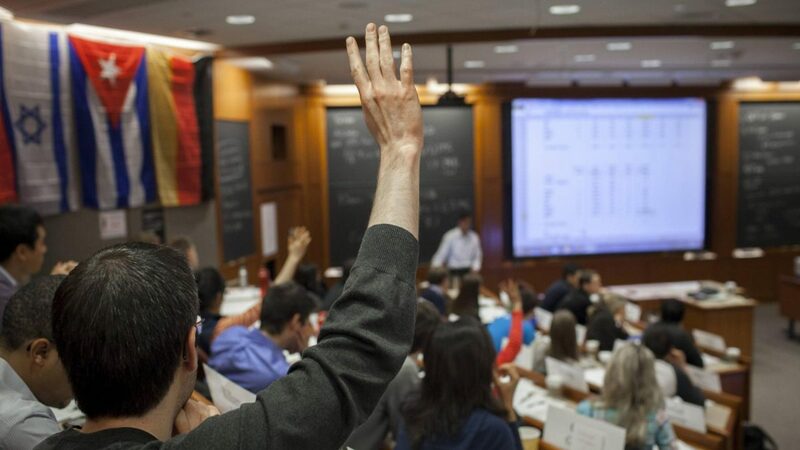 Arguably, because the method has been so widely adopted by other schools, which tend to combine it with traditional lecture formats (at Harvard, it’s used almost exclusively), it’s come to be synonymous with business education itself. But the authors of a recent paper argue that Wallace Donham, the man credited with establishing the case method as a force at HBS in the 1920s, had evolving views of business education that have never been surfaced, and that contradict the sense that management lessons should be viewed through the narrow lens of the case study. In Donham’s writing and correspondence, Todd Bridgman, a management professor at Victoria University of Wellington in New Zealand and lead author of “Restating The Case: How Revisiting the Development of the Case Method Can Help Us Think Differently About the Future of the Business School,” finds evidence that years after installing the case method, Donham sincerely believed it was too indifferent to larger societal ills, too insensitive to the labor market, and thus to economic prosperity and equality among workers. During the Great Depression, “broad questions were suddenly being raised about the very future of capitalism,” says Bridgman. In the upheaval, he says, Donham saw the limits of the approach he had championed. Strangely, Donham’s apparent change of heart is not recognized in conventional histories of HBS and its iconic case method, according to Bridgman and his co-authors, management professors Stephen Cummings, a fellow professor at Victoria University, and Colm McLaughlin of the University College Dublin. Bridgman says this surprised the group. He and his colleagues, whose work was published in the Academy of Management, propose that the case study, now central to the HBS brand and its revenue, has been given a convenient origin story that created a new, accepted truth. Bridgman and his colleagues’ intriguing counter-history of HBS begins when Donham arrives in 1919, becoming its second dean. The school was only 11 years old then, but it was already using what it called “problem solving” as a method for learning—to a degree. As the authors report, the school’s founding dean, Edwin Gay, had adapted the case study method pioneered at Harvard’s law school, of which Donham was an alumnus. Under Gay, however, the school had struggled to find problems as fodder for course lessons. Donham would change that by expanding what was then the research department of the school and tasking it with producing case textbooks. Harvard would build a library of cases that reflected the businesses of the times, and in engaging with their predicaments, he hoped, scientific theories of management would emerge. As the case method ramped up at Harvard, so too did the US economy and its corporate powers—until 1929. Following the stock market crash of that year, amid mass unemployment, falling prices, and economic instability, public opinion of corporations and their profit-seeking motives naturally soured. And Donham began revisiting his mission at Harvard. By this time, he had become friendly with the mathematician and philosopher Alfred North Whitehead, a British transplant who had left Cambridge University for Harvard, where he wrote on metaphysics. Whiteheld held strong convictions about what education should be. Specifically, he “rejected any distinction between abstract and practical knowledge,” Bridgman and his fellow researchers note. His support of hands-on training thus bolstered Donham’s approach to teaching business at a time when the academic community was questioning whether the school even belonged on its campus. However, the great thinker also worried about the era’s preoccupation with capital and material goods. In the book Science and the Modern World (MacMillan, 1925), Whitehead advocates for “concrete appreciation of the individual facts in their full interplay of emergent values,” in any discussion of how societies should be organized. Donham had once asked to publish one of Whitehead’s essays on schooling business leaders, in a program being printed to celebrate the opening of a new building on campus. (Whitehead instead offered his piece to The Atlantic Monthly magazine.) The dean also suggested that a third year be added to Harvard’s graduate program, a doctoral level year focused on the relationship between business and civilization. But the tragedy of the Great Depression, while demonstrating the need for just this type of reflection, also meant Donham couldn’t secure financing for that third year. After the war, American business picked up again with renewed strength, and the conversation changed. Whatever misgivings Donham had were put aside. But the research points to other aspects of Donham’s life that would support their thesis. For instance, in 1921, Donham had hired the union leader Robert Fechner, and was forced to defend that decision in the face of significant anti-labor pressure. Fechner was head of the International Association of American Machinists, a union affiliated with the American Federation of Labor, and his appointment was considered troubling to local industrialists, who let their disapproval be known to the school. Donham, however, would not back down. He felt that for students to build a holistic understanding of business, they needed to hear labor’s view. Oddly, only one history of the case method’s development even mentions Fechner, Bridgman and his research partners find. This bit of lost history “challenges the story of a single-minded and enduring cultivation of a managerial worldview,” they write. Today, they add, the role of labor has been largely “air-brushed” out of business school class materials, while industrial relations departments have been rebranded as “human resource management” departments, or folded into departments of organization studies. An educational gadget, or something worse? One of Donham’s contemporaries, a Harvard business school professor who had lost faith in the case study method as a potential tool for deep critical thinking, eventually called the case study an “educational gadget,” the researchers note. That may be too benign a description for today’s critics. In The Golden Passport: Harvard Business School, the Limits of Capitalism, and the Moral Failure of the MBA Elite (Harper Business, 2017), business writer Duff McDonald gives the case study method its due as the school’s “signature contribution” to management curriculum. He also attacks its approach, however, and its overemphasis on how one thinks and undervaluing of what one thinks. McDonald compares the case method to a performance, appropriately staged in a 100-seat amphitheater, making Harvard Business School, he writes, “as much a school of dramatic arts as it is one of business.” But his most damning criticism is saved for what he sees as the school’s contribution to financial crises, and to trends like astronomic CEO pay and the heavy emphasis corporations now place on short-term results. “In McDonald’s view, the school has contributed to pretty much every bad thing that has happened in American business and the economy in the last century,” the New York Times wrote of his book. In 2021, Harvard Business School will celebrate the 100-year anniversary of the first written case study, which was a single-page document about The General Shoe Company. In their historical account of Harvard Business School, the authors present a faculty, and especially a Dean, deeply engaged in figuring out the underpinnings of the case method—with the challenging of ideas one would want in an academic institution. They also bring to light the thoughtful debate that shaped the evolution of the case method at HBS. That debate continues today at HBS as we work through the future of the case method … and the creation of complementary methods (the field method of experiential learning, online learning). The school, whose illustrious alumni include some of the world’s most powerful men and women in finance and corporate leadership today, like JPMorgan Chase CEO Jamie Dimon and Facebook COO Sheryl Sandberg, says it welcomes ongoing debate over how to best prepare its students for the business world. Part of the problem with decision-forcing exercises alone is that they ask students to work within the existing system, without examining its failures. Bridgman’s paper suggests that business professors could use cases to look at how managers think, rather than to teach students how to think like a manager. In some cases, pressured by governments or by customers, many businesses are now making an economic case for sustainability and social responsibility. But it has taken a long time to get here, and it may not be enough. Perhaps if the history of business education had taken a different path, the pressure to do well by the world would have been coming from the corner office all along.